Moving from the bike-hostile environment of Los Angeles (just ask L.A. Mayor Antonio Villaraigosa about his bike accident) to bike-friendly Washington, D.C. and Arlington, Virginia has been pure pleasure. While L.A. is set to start moving forward with its 2010 Bike Plan, the D.C. area has been working hard for years to put in place a bicycle infrastructure and a bike-friendly culture. After nine years in car-crazy Southern California I've been exploring D.C. on my bike and here are some initial observations. As always Arlington -- the urban county across the Potomac River from the Nation's Capital -- is a paradise for bike riders. 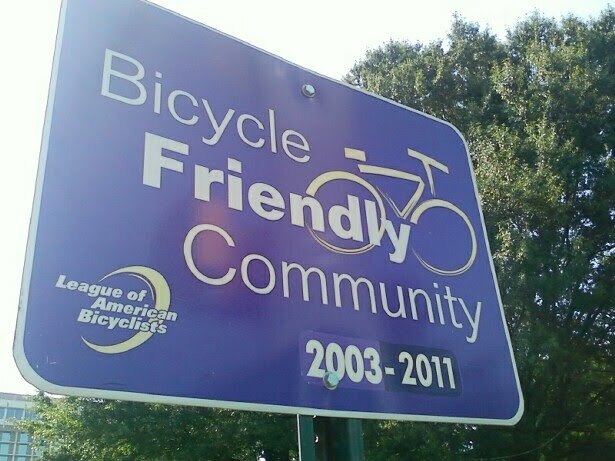 There are bicycle lanes, bike sharrows, bike shops and bicycle signage all over the county. The website BikeArlington provides a wealth of resources for Arlington bike commuters. 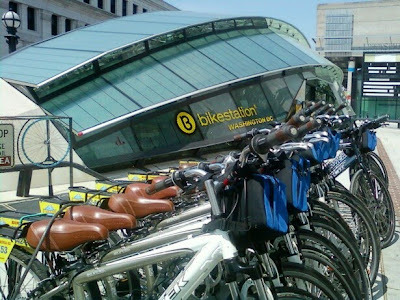 And Arlington will be participating in phase two of D.C.'s bike sharing program. Capital Bikeshare will be launched in September of this year with plans for more than 100 bikesharing stations and more than 1,000 bikes. Across the Potomac River, D.C. has been holding its own in terms of being as bike-friendly as possible. The website Bike Washington provides information on topics such as bike trails and upcoming events. Two new projects are helping put D.C. on the map when it comes to national bike-friendly communities. The Pennsylvania Avenue bike lanes officially opened on June 22 with much fanfare. D.C. Mayor Adrien Fenty and Transportation Secretary Ray LaHood were on hand to dedicate the new lanes. According to the Washington Post story, the District has more than 50 miles of bike lanes with a goal of increasing that number to 80. Also, the Census Bureau reports that the number of Washington area bike commuters doubled from 2000-2008, exceeding 2 percent of all commuters. The Bikestation at Union Station is one of the most striking architectural designs in the city. 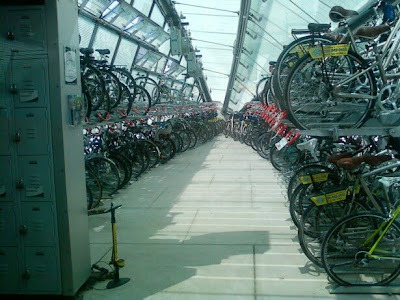 Shaped like a bicycle wheel, the facility provides indoor bicycle parking and rents out bikes through Bike and Roll. It is a potent and stunning visual reminder that D.C. is serious about transforming into one of the top bike-friendly places not only in the United States but indeed the entire world. The 1,600 sq. ft. facility houses over 100 bicycles and is the first of its kind on the East Coast. The facility also provides a changing room, lockers, bike repairs and retail items for sale. 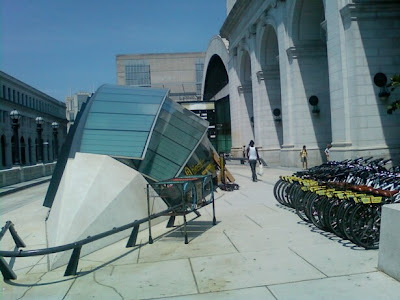 Its location at Union Station offers a seamless connection from the Metro Red Line or Circulator Bus to your securely stored bicycle.